Oh no… this is ugly. 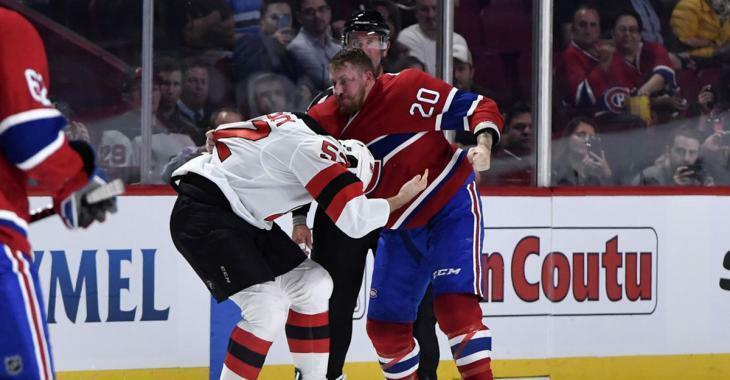 In case you missed it, last night Montreal Canadiens forward Nicolas Deslauriers was taken to hospital following a particularly nasty fight with Brandon Baddock of the New Jersey Devils. Deslauriers appear to get ROCKED early on in the fight , but recovered to score some shots and eventually take Baddock down to end the fight. It’s being speculated by fans and analysts that Deslauriers suffered a concussion during the course of the fight… which, well let’s just say it was the best of the preseason so far. That’s just some good, old fashioned knuckle chucking at the Bell Centre in Montreal. You can see Deslauriers get rocked and nearly go down early on in the fight, but he recovers to land some HUGE left handed haymakers and take Baddock down to the ice HARD. We’re unabashed fans of a good tilt here at Hockey Feed, so while we hate to see someone get injured as a result of a fight, we still applaud both individuals for dropping the gloves and putting on a good show. Great scrap. As for Deslauriers, no word yet on whether or not he suffered a concussion or what his status will be moving forward. Expect an announcement from the Habs later today. Here's hoping that he's no worse for wear and that he can back into the lineup and resume his plan to crack the Habs' roster for 2018-19. The 27 year old native of La Salle, Quebec is looking to nail down a full time spot with the Habs this season after splitting the 2017-18 campaign between the big club and their American Hockey League (AHL) affiliate Laval Rocket. The 6 foot, 1 inch, 215 pound winger scored 10 goals and 14 points in 58 games with the Habs last season. Prior to arriving in Montreal, Deslauriers spent four years with the Buffalo Sabres and three years with the Los Angeles Kings’ organization. The scrappy, two way forward was originally picked in the 3rd round (84th overall) by the Kings in the 2009 NHL Entry Draft.